Talk about a meeting of minds. I had to take a step back, literally as the Minnesota pavilion here at BIO got a little crowded. For two hours today trade and research delegates from Sweden crowded into the pavilion for formal and casual one-on-one meetings with delegates from the state. In all, 90 people were involved. The event, sponsored by LifeScience Alley and DEED, was a great example of what's possible at these events. 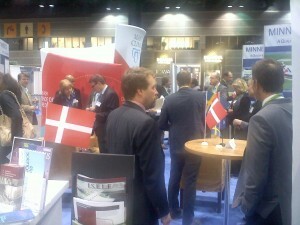 The Swedish representatives came from government, academic and industry organizations. All had questions and had done their homework. I have no doubt that this morning's talks will grow the existing relationships and spark new ones. The whole thing wound up with joint lunch.